Available as low as $99.99 per oz over spot! The latest coins from the Lunar Series II program are now available from the Perth Mint. 2017 is the Year of the Rooster, and Perth is celebrating these hardworking individuals with new designs for both the gold and silver versions of the coin. Today, the 2017 2 oz Gold Australian Rooster Coin is available on Silver.com in BU condition. Ships in a plastic capsule to protect the coin’s condition. Tenth coin in the Lunar Series II release schedule. Consists of 2 Troy ounces of .9999 fine gold. Face value of $200 (AUD) is fully backed by Australia’s government. Obverse includes Queen Elizabeth II’s portrait. Reverse bears the image of a rooster. In Chinese culture, it is said that people share the emotional and character traits said to be assigned to each animal in the 12-year cycle of the Zodiac. Those born under the sign of the Rooster are believed to be hardworking, honest, loyal, and sociable beings, not unlike a rooster can be. The Lunar Series II program from Perth Mint is winding down as the Year of the Rooster release represents the 10th in the 12-year program. Again this year the mint has released separate designs for the silver and gold versions of the coin. On the reverse of each 2017 2 oz Gold Australian Rooster Coin is the image of a solitary rooster, standing on one leg and its beak open as its calls out to the morning sun. 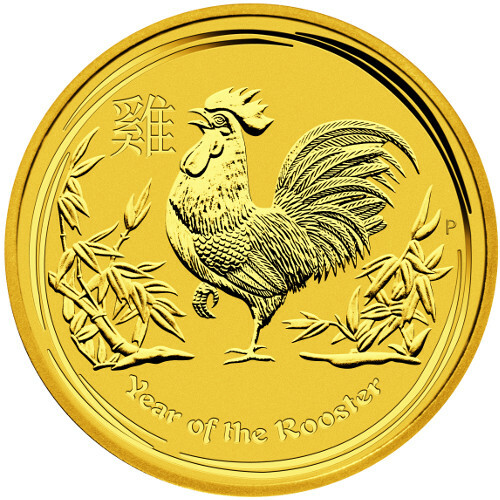 Background images include bamboo foliage, and the engravings of the Chinese symbol for rooster, “Year of the Rooster,” and “P” for the Perth Mint are featured on this side. 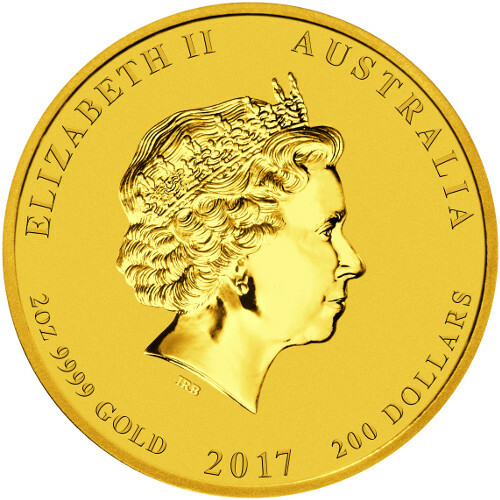 The obverse of each 2017 Gold Australian Rooster Coin includes the right-profile portrait of Queen Elizabeth. Though a new profile of Her Majesty is available, the Perth Mint continues with this 1998 depiction to ensure all 12 release of Lunar Series II have the same obverse. 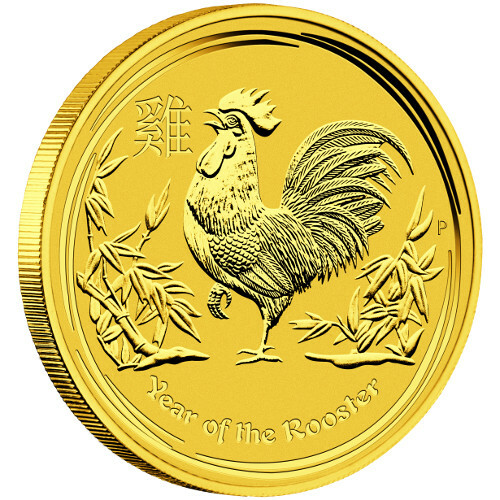 Each 2017 2 oz Gold Australian Rooster Coin in this product listing has a BU grade. Coins in Brilliant Uncirculated condition show no signs of wear, tear, or handling. You may notice minor flaws such as breaks in the luster, spotted surfaces, or contact marks from the coining process. Perth Mint was originally opened in 1899 as the final of three Royal Mint facilities in Australia. The three mints, including the Sydney Mint and Melbourne Mint, were the first Royal Mint facilities ever opened outside the United Kingdom. Please feel free to contact Silver.com with questions. You can reach our associates at 888-989-7223, connect with us online using our live web chat, or email us directly.